I love home cooking. I really can’t get enough of it. I don’t mean greasy home fries and some thrown together stuff that some restaurants call home cooking. I’m talking about the sort of food your mamma would cook for ya if she had the time and she really loved you. The sort of food I can recall from childhood, everyday stuff we’d have whenever, usually heavy on vegetables and light on meat. Done had a meal like that at Mama Max’s in Prescott — and the best part was, I also got a great dessert. Can’t beat that with a stick. My photographer and I stopped in on our way to the Texas State Fair last week. 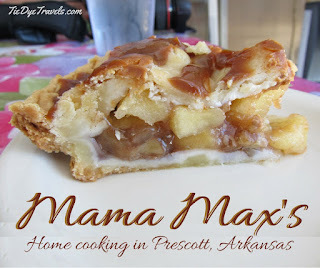 I have been meaning to make it to Momma Max’s for a while but was always either too early or on the wrong day. This particular Wednesday we were in luck. The place was bustling and it had just started serving lunch. It took us a little while to decide on our lunches. I had originally intended to check out the highly recommended burgers, but once I saw the list of vegetables (which is the first thing on the menu) I changed my mind. 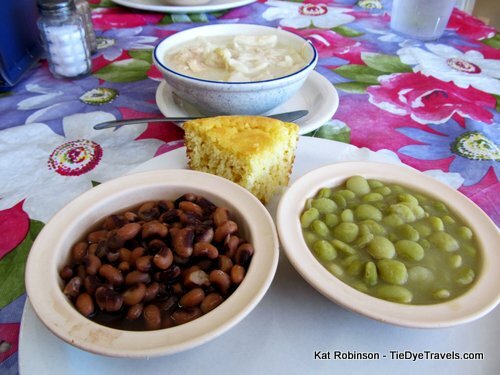 The list was extensive — mustard and turnip greens, pinto beans, PurpleHull peas, lima beans, beets, candied yams, fried okra, potato salad, cole slaw, mac & cheese, fresh fried corn, green beans and mashed potatoes. Yeah. It made my pescatarian photographer happy, too — knowing he could get some good eats. 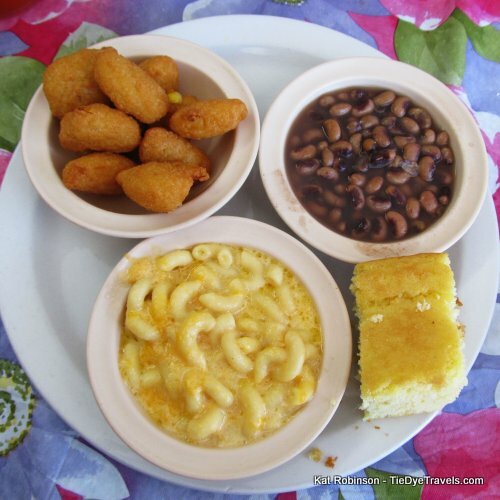 He chose himself a vegetable plate ($1.50 a vegetable), picking up some of those PurpleHull Peas, the macaroni and cheese and some fried corn nuggets (located under appetizers). 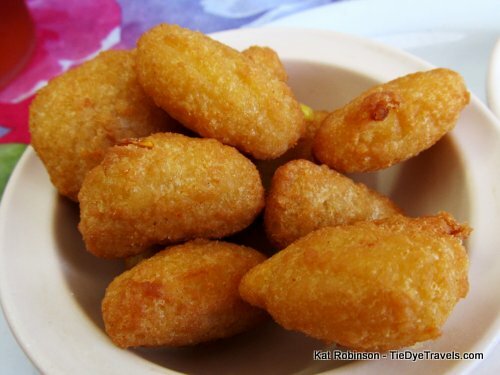 He told me the corn nuggets were some of the best he’s had, nice and corn packed and buttery. 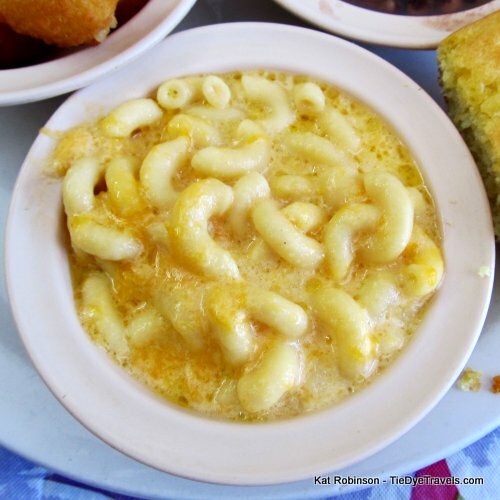 He also bragged on the macaroni and cheese, which was made with elbow macaroni and Cheddar cheese. Yes, it looked like hell since Cheddar doesn’t melt as well as other cheeses. But it was good stuff. 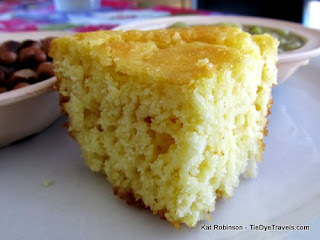 I’d been talked into some cornbread to go along with my Chicken & Dumplings ($7.50), a big bowl of dumplings and shredded chicken with two sides. 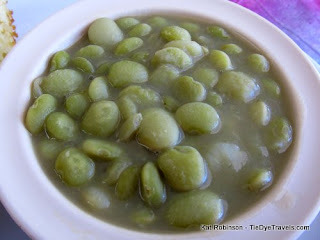 Of course I went for the PurpleHull Peas, and some Lima Beans too. I knew with the fair challenge coming up I would need all the energy I could muster. 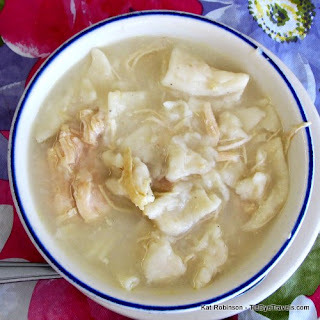 The Chicken & Dumplings were good — a little undersalted, maybe, but the dumplings were nice and firm and the chicken had a lovely flavor to it. There was a low broth-to-dumpling ratio, too — more like an entrée than a soup. I dug my peas and beans, though. 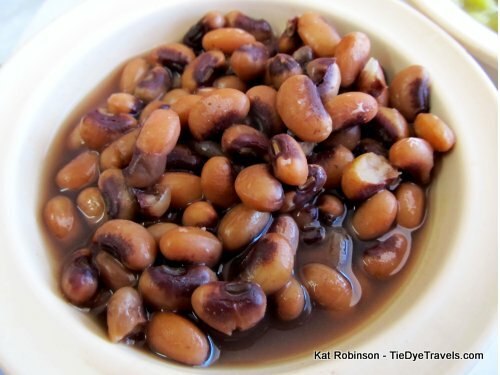 The PurpleHulls had just a hint of liquid smoke flavor to them, just enough to enhance the little sweetness to them. The Lima Beans were excellent — buttery, sweet and falling apart. crumbled up in the peas and beans, a sopping cornbread. Of course, I haven’t even touched on the pies yet. 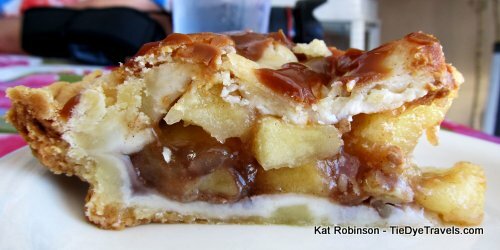 There’s a pie case when you walk in that, depending on the time of day and the day of the week, will be anywhere from half to completely full of pies and cakes and whatnot. Pies are $3 a slice, cakes $2.50 and the homemade turtles $2. I passed up a chance on a very tall, very rich looking chocolate cake for pie. 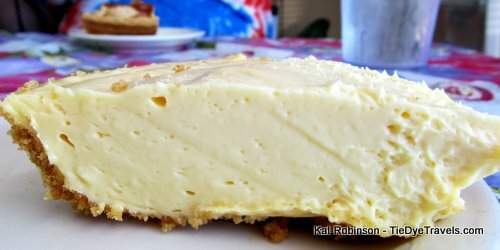 My photographer chose the lemon icebox pie, which was homogenously smooth and sweet with just the right amount of tartness. 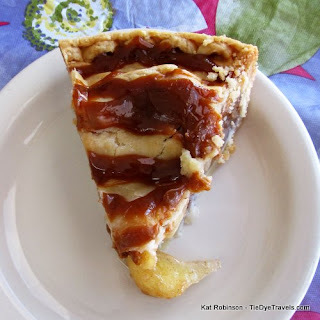 My Caramel Apple Nut pie, though… now there’s you a pie. 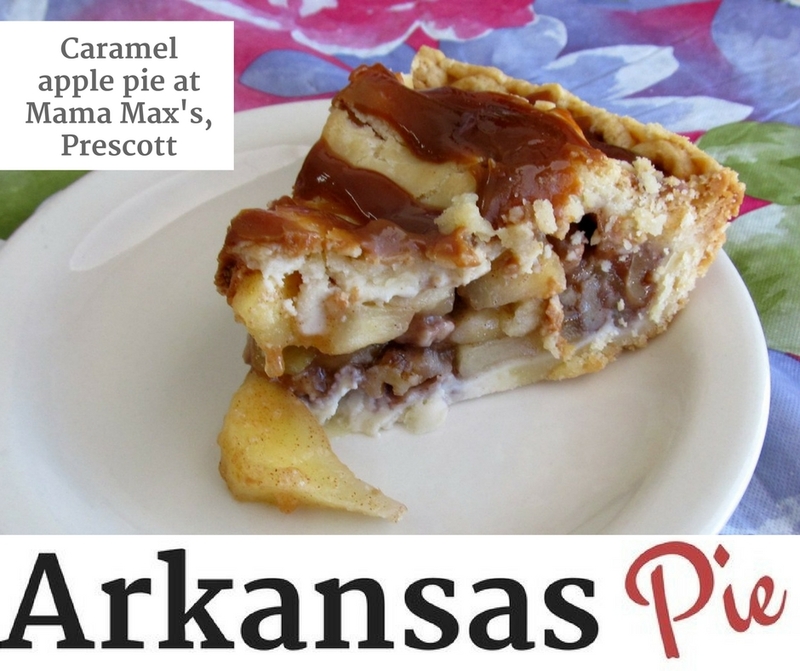 A prime Southern pie filled with heat-softened chunks of pecans in-between the two different types of slow-cooked apples. The crust was nice and savory, a salted top and bottom flaky crust that soaked up the apple essence quite well. What made it over the top good, though, was the drizzle of melted caramel over the top. That burnt sugar flavor was just the right thing to balance the tart apples and meaty pecans. That dang pie ate like a meal, and I was already about stuffed. But I ate it. I ate it all, even though it hurt. It was too good to leave. The whole meal was less than $20, and we weren’t even hungry for about eight hours. It stuck with us. I do have to say, one of the diners at the next table over ordered a barbecue sandwich while we were in there, and I am going to have to go back for that. Oh, it smelled divine. You’ll find Mama Max’s at 1102 West Main Street in Prescott — that’s Highway 24. If you take the first Prescott exit from I-40 heading south (the one with the Low’s Truck Stop) it’s a short jaunt down on the left. It’s open Wednesday through Saturday 10 a.m. to 8 p.m. and Sunday 10 a.m. to 6 p.m. They do carry-out, too. (870) 887-5005.